Bangkok, River Kwai, Ayutthaya, Nakornsawan, Sukhothai, Lampang, Chang Mai & Chiang Rai! Arriving Bangkok, our Thai representative will be at the airport to welcome you & transfer to hotel. Today's city tour includes The Grand Palace, Funeral Hall, Wat Pra Kaew, Wat Traimit, Wat Pho, Wat Benchamabopit & temple of Dawn plus a canal tour on a private boat. Transfer back to hotel. Evening to enjoy the traditional Thai dinner & dance. An early morning to see the famous Damnern Saduak floating market with stop at Nakom Pathom where the largest Pagoda in Thailand located. Return to Bangkok & rest of day at leisure. After dinner at Riverside restuarant, evening trip to see the night market. This morning we depart to Kanchanaburi to visit the River Kwai Bridge & the war cemetery. Take a train ride on the nototious Death Railway Line & lunch at a local restaurant. After lunch we take a longtail boat for 45 minutes into the jungle & check in at the Jungle Rafts, a unique hotel built on floating rafts, the river flowing swiftly underneath. The rest of the afternoon is at leisure to enjoy the peaceful atmosphere. Dinner by lantern (there is no electricity!) & culture show in the evening. After breakfast, we take a boat ride upstream to visit the Saiyoke Yai National Park, visiting the waterfall to experience nature at its best. 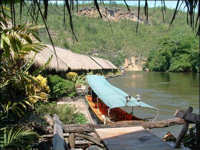 Return for lunch at Jungle Rafts, then check out of Jungle Rafts and take the boat downriver to the Resotel. Afterwards, visit the Lawa Cave and explore the fascinating rock formations. Dinner and accommodation at Resotel. 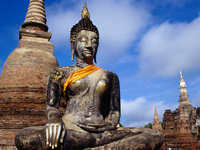 After breakfast check out Resotel to visit hell fire pass and continue travel to Ayutthaya ancient city. After lunch at a local restaurant visit Bang Pa-In Summer Palace to enjoy the lovely gardens and stunning Chinese architecture. Trip continues to Ayutthaya province to check in at hotel. Dinner at riverside restaurant. 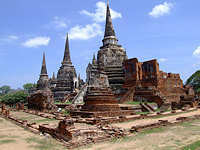 After breakfast check out of hotel to visit historical ruins of Ayutthaya Palace and four main Buddhist temples. Lunch at a local restaurant, after lunch proceed to Lopburi province formerly called "Lawo" the second capital city of the Ayutthaya Kingdom, visit "Phra Prang Sam Yot" the three prang (towers). 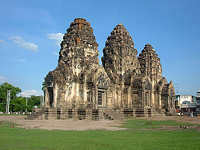 Khmer architecture is a landmark and provincial symbol. Visit San Phra Kan a Brahman Shrine where a troop of monkeys begs for food. Afterwards visit King Narai's Palace (1665), the buildings were designed in a mixture of French and Khmer styles. Trip continue to Uthai Thani Province to visit Wat Tha Sung, a holy temple the interior convocation hall of which is decorated with glass, sparkling everywhere. Visit local evening fresh market in the town and see the floating rafts where local people live. Depart to Country Lake Nature Lodge, dinner and over night. Check out after breakfast tour to Nakorn Sawan Province to visit Wat Kiriwong, a holy temple built on the hill top. 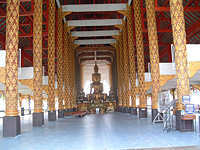 A huge sitting Buddha image and a 'Mondhop' pure Thai architecture building are situated here. After the temple continue to Phisanuloke province to visit Sgt.Maj. Dr. Thavi Folklore Museum exploring a private collection of antique items representing Thai rural life, indigenous arts, farming and trapping equipment and household items. (TAT Award 1998). Lunch at local restaurant, after lunch visit Wat Pra Sri Mahathat the most important temple which has an image of bronze sitting buddha in Sukhothai style and cast in 1357. Leave Phisanuloke to Sukhothai Province. Dinner at local restaurant in the night market in the town. Overnight at Sukhothai. 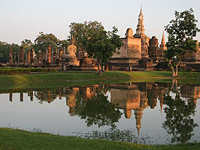 After breakfast,check out hotel and start the day at Sukhothai Historical Park. Sukhothai was the first independent Thai Kingdom in the 13th century and has been selected as a World Heritage Site by UNESCO in 1991. Lunch at a local restaurant, after lunch visit Si Satchanalai, the second city of Sukhothai where the old Thai Sangkhalok Pottery was made by Chinese artisans in the 13th century. Si Sachanalai is also one of the World Heritage Sites. Our trip continues by road through mountains and forests, arriving at Lampang province. Check in at hotel. In the evening, take a horse & cart ride around Lampang Town (the only town in Thailand with horses & carts), getting off at a local restaurant for dinner. Overnight in Lampang. After breakfast, our city tour visits the old Northern style temples and sees the local lifestyle of the northern people. Visit the most important Wat Pra That Lampang Luang temple with Lanna architecture. After Lampang we cross a moutain range to Lamphun province to visit the tall golden Cedi (pagoda) 46 meters high and 800 years old in Wat Pra That Hariphunchai. Lunch at a local restaurant, after lunch visit the famous home industries, silverware, bronzeware, umbrellas & parasols, silk weaving, teak furniture and jewelery factories all in same area. 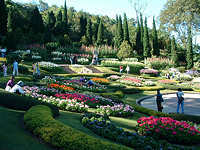 Arrive to 'Rose of the North' city Chiang Mai, check in at hotel. Dinner at riverside restaurant. After dinner visit the night bazaar. Over night in Chiang Mai. Today's city tour includes Wat Suan Dok, the temple supported by the Royal Family of the Lanna Kings, also visit two oldest temples (over 700 years) inside the city wall. Drive around the old city & see the original city moat, ruined city gates & local market. This evening, we take dinner at Chiangmai Cultural Center with traditional northern food (Khantoke) & Northern Thai dances such as the Fingernail dance, Candle Light dance, Hill Tribe, Aka, Yao, Meo, Lisu dances etc. 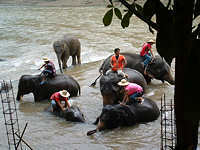 Today visit an Elephant Camp (60 kms north of Chiangmai), watching elephant training & working, then take a ride on an elephant through foothills & jungle. After the elephant ride transfer by oxcart to restaurant for lunch. Afternoon trip by bamboo rafting to visit orchid nursery & butterfly farm before returning to Chiangmai. In the evening don't miss a stroll at the fascinating Night Bazaar in the city. Drive from Chiang Mai to Chaing Rai, stopping at hot spring market then continue to boat landing for a boat ride on Mea Kok River. After lunch at local restaurant, drive to city centre & check in at hotel. This morning drive to Doi Tung & visit Princess Mother Commemorative Hall, gardens & Villa. Afterwards we visit Yao & Akha Hill Tribe villages, then drive to the Golden Triangle area & have lunch at Sri Wan riverside restaurant. After lunch a boat trip to Chiang Siang & visit Wat Chedi Luang before driving back to Chiang Rai. Free at leisure until transfer to airport for your flight to Bangkok to connect to your return flight to UK or other destination. Alternatively, extend your trip to any beach resort in Thailand. for example Hua Hin, Pattaya, Koh Samet, Koh Samui or Koh Phuket etc. 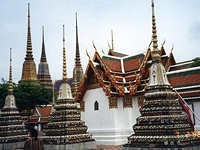 This new tour takes you from Bangkok through the historic capitals and temples of Thailand to Chiang Rai in the North!